Brennan: Can I start buying you things now? Booth: No, you can't. But, hey, I'll tell you what, you can buy Christine stuff. Brennan: I know you'd like a new grill. Booth: Christine would love a new grill. Ms. Julian: You're gonna have to settle with running around, shooting people until you grow up. Booth: Well, you wouldn't love me any other way, right? It's only a flesh wound, Lance. Permalink: It's only a flesh wound, Lance. [to Starling] Just aiming my big shrinky brain at her. Thought you'd like to see what I was packing. Sweets: The dead husband showed up. Alive. 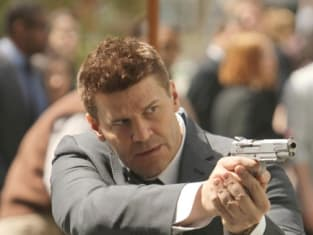 Booth: Bones made a mistake? Sweets: I know, it's even starting to sound weird to me. A desk job? It would be like caging an animal. You're meant to run free, Booth. [to Booth] Sorry, cherie, but there is no one burlier or cuter than you. Permalink: Sorry, cherie, but there is no one burlier or cuter than you. Starling: Why'd she call you doctor? Sweets: Because I'm a doctor. I'm a psychologist, a profiler. Starling: You've gotta be kidding me. I'm working with a shrink. Sweets: I'm more than just a shrink. The bureau gave me a gun. I should take the lead on questioning people. It's kind of my thing. Starling: Just don't shoot me. Angela: I'm no coroner, but I'm saying the cause of death was humungous explosion.